A firmware tweak improves performance, especially sustained throughput. 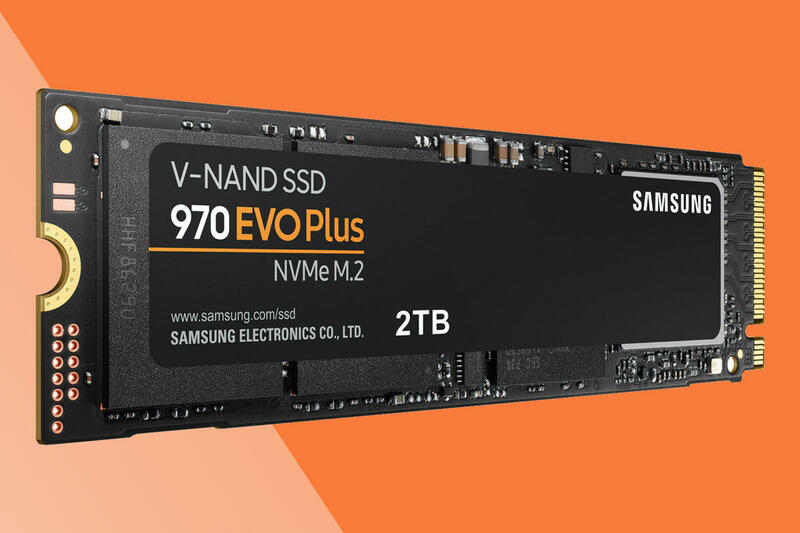 Samsung's 970 EVO has always been the fastest of the low-priced NVMe SSDs, and the company's new 970 EVO Plus, announced Tuesday, further cements that position. Samsung claims up to a 57 percent increase in performance for the Plus over the older 970 EVO. I didn't see quite that, but sustained writes when the drive was using its SLC cache increased by 10 percent, and jumped by a very welcome 42 percent when writing to the main body of TLC NAND. Note that the 1TB version will be the first out the gate. The 2TB version in the photos will be available later. The 970 EVO Plus is basically the same drive as the 970 Evo, using the same 64-layer stacked TLC (Triple Level Cell/3-bit) NAND and Phoenix controller with improved firmware. Note that Samsung refers to the NAND not as TLC, but as 3-bit MLC V-NAND (vertical). MLC (Multi-Level Cell) was a poorly conceived moniker that became associated strictly with 2-bit NAND, but obviously can be applied to any type of NAND that stores more than one bit per cell. The 970 EVO Plus is available in 250GB, 500GB (the capacity we tested), and 1TB flavors for a $90, $130, and $250, respectively. At 25 cents per gigabyte in the largest capacity, and a little bit more in the lesser capacities, those are good prices. There are 1TB PCIe x4 NVMe drives out there that are pushing the 15-cent mark, though without delivering the same level of performance. 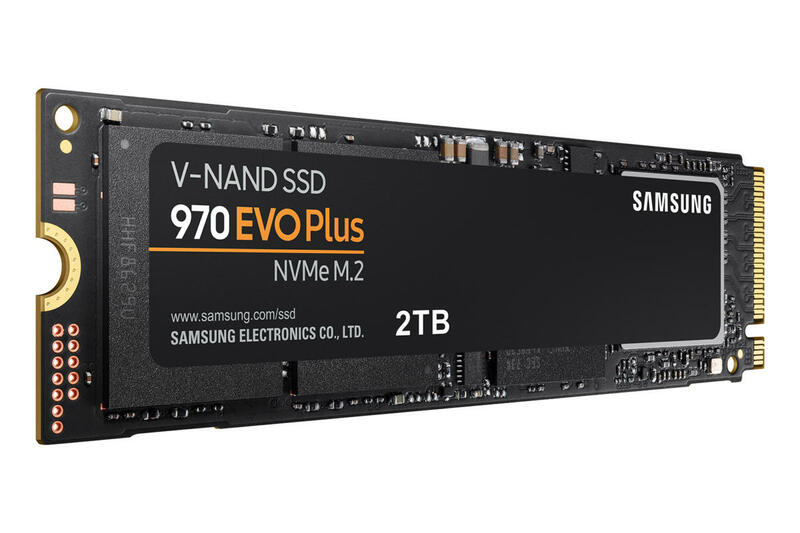 Samsung's 970 EVO Plus in its 2TB capacity, which isn't shipping yet according to the company's PR. We tested the 500GB version. 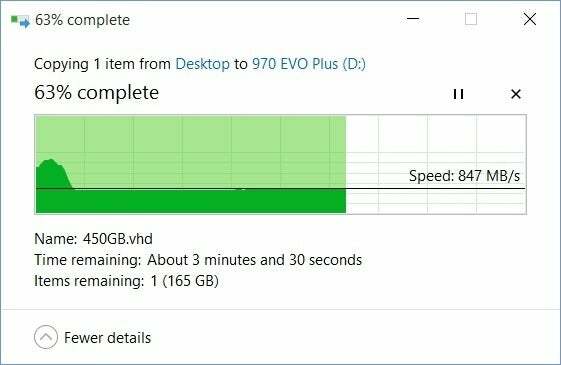 The 970 EVO Plus carries a nice five-year warranty and is rated for 150TBW (TeraBytes Written) per 250GB of capacity over the life of the drive. Don't be surprised if you don't hit that write figure even in 10 years, or if the drive lasts longer than that. It's been quite a while since I saw an SSD fail, and I've yet to write enough data to one for it to lose capacity. Samsung also claims that the 970 EVO Plus is more power-efficient than its predecessor, though that's something that generally only interests pros who run lots of them in arrays or servers. The 970 EVO Plus (green bars) is indeed quite a bit faster than the plain EVO (gold bars) in several ways, especially with sustained writes to the main body of NAND and 4K writes when lots of queues are in play. Note that the numbers below are from the 500GB drive we tested. The plain copy test times will vary according to capacity, due to different cache sizes and other related factors. As you can see, there's a nice improvement over the plain 970 EVO in terms of write speed. CrystalDiskMark 6. Longer bars are better. 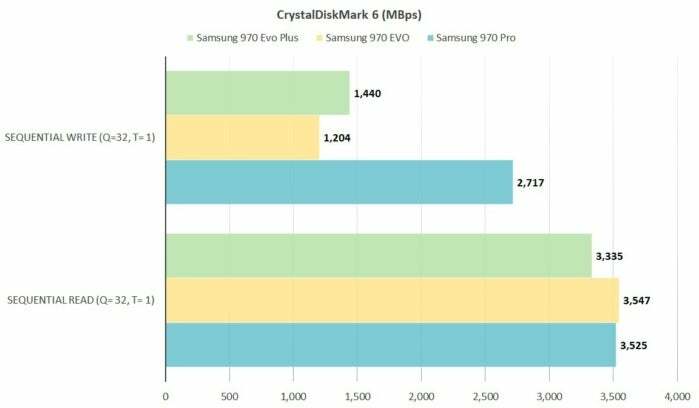 While CrystalDiskMark 6 rated the older EVO as a faster reader than the Plus, it also showed a significant advantage for the Plus when it came to writing. Note that these speeds are with caching in play. See the next section for info on what happens when the EVO Plus runs out of cache. 4K write performance in AS SSD was a landslide victory on the part of the newer EVO. Longer bars are better. 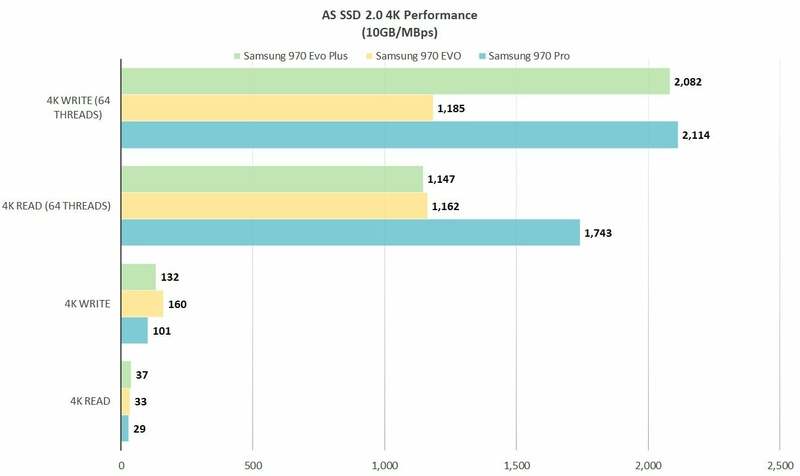 The AS SSD 2 benchmark showed a huge improvement in small block 4K write performance for the EVO Plus over the plain EVO. So much so that we tested and cross-checked twice to confirm what we were seeing. Thanks to a higher write rate when it runs out of cache, the EVO Plus proved significantly faster with sustained writes than the plain EVO. Our 48GB copy tests bore out the CrystalDiskMark and AS SSD results, though less dramatically. 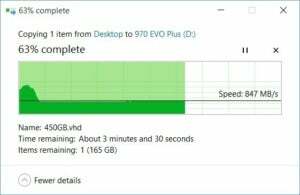 The drive is faster, so given the same price, definitely go for the EVO Plus. Or of course the 970 Pro, which, while considerably more expensive, suffers no performance drop-off during long writes. One thing to note about the performance is that 3-bit NAND, when written natively as such (it can be treated as 1-bit or 2-bit NAND with a corresponding increase in performance), isn't all that fast. Once cache has run out, performance on all TLC drives drops. I've seen as low as 90MBps, but that's rare anymore (except for 4-bit QLC--see the 860 QVO review). The 970 EVO Plus drops only to about 850MBps, which is still nearly twice as fast as a SATA SSD. That's also about 200MBps faster than the older 970 EVO when it runs out of cache. The 970 EVO Plus's sustained write rate dropped from about 1.7GBps to around 850MBps. That's still almost twice as fast as SATA and better than many TLC NVMe SSDs. But cache size generally varies according to the capacity of the drive. The 500GB 970 Plus I tested ran out of it at around the 20GB to 30GB mark during a long write. Though I didn't have the other capacities to test, it's quite likely that the 250GB drive's speed will drop at around 10GB mark, and the 1TB drive's at around 40GB to 50GB. There is some smart caching going on (Samsung calls it "Intelligent TurboWrite"), so exactly when you run out might vary according to how full the drive is, or how much data you are writing. Not many users will write outside of the cache very often, and 850MBps is still a pretty fair transfer rate. But if you don't want to see this kind of drop, you'll need something like the 970 Pro, or WD's Black NVMe. The 970 EVO Plus is more affordable than ever, and will run like a champ the vast majority of the time. Even when it drops out of cache, 850MBps isn't going to cause you much buyer remorse. If you want something better than bargain-basement (which is still pretty fast in the grand storage scheme), the the 970 EVO Plus is what you're looking for. 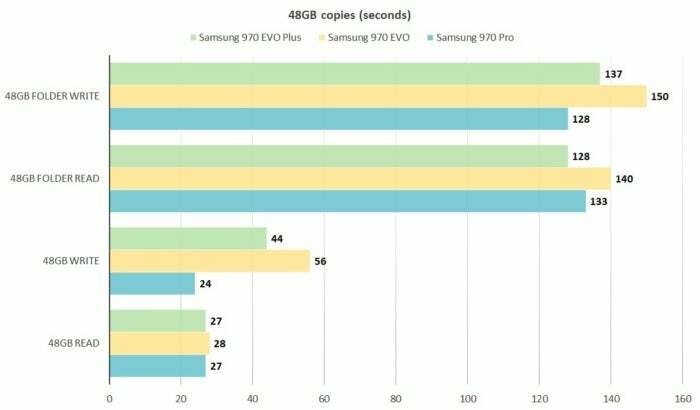 The Samsung 970 Evo Plus is faster and cheaper than the 970 Evo Pro, and easily one of the better performers in the low end of the market. The five-year warranty for the Evo Plus is also very nice to have.